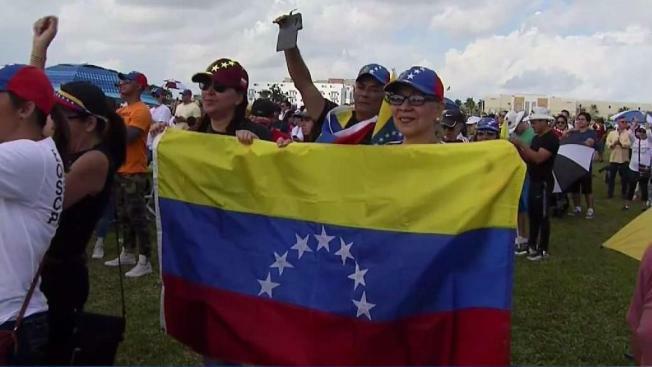 Thousands of Venezuelans participated in demonstrations in South Florida on Saturday. Nicolas Maduro, the embattled president of Venezuelan, is being called to step down amid worldwide protests. Juan Guaido, the leader of Venezuela's National Assembly legislature, is being recognized as the South American country's interim president. 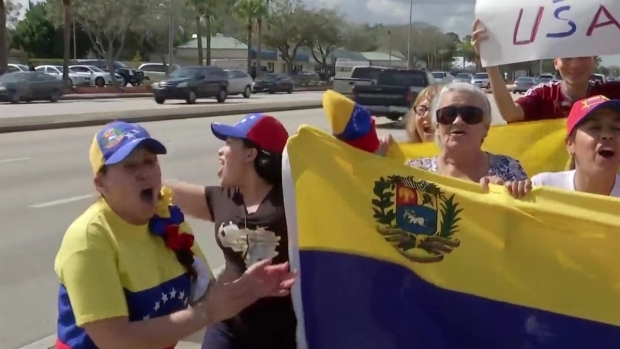 Thousands of Venezuelans gathered throughout South Florida on Saturday to show support for interim Venezuelan President Juan Guaido and to protest against Nicolas Maduro's regime. Rallies took place in numerous locations, including Doral, Weston and West Palm Beach. Vice President Mike Pence was in Doral on Friday where he addressed the Venezuelan crisis during a meeting with Venezuelan community representatives. “This is no time for dialogue. This is time for action and the time has come to end the Maduro dictatorship,” Pence wrote on Twitter. Venezuelans protest in West Palm Beach against Nicolas Maduro's regime and in support of Juan Guaido. The vice president met with Florida Gov. Ron DeSantis, Sens. Marco Rubio and Bill Scott and U.S. Rep. Mario Diaz-Balart. President Donald Trump’s administration has reiterated in recent weeks that Maduro is the “former president” of Venezuela and has warned him to refrain from any intimidation and violence against Guadio or any U.S. diplomat in Venezuela. The Trump administration imposed sanctions this week against PDVSA, which would freeze the assets of the state-owned oil company and payments made to the Maduro regime. The protests are part of pressure mounting against Maduro to urge him to step down from power. Maduro won the election with a wide margin last May. Opposition leaders considered the election to be fraudulent because their main party leaders were disqualified. The opposition says Maduro usurped the presidency and considers his second six-year term to be illegitimate. The Venezuelan Constitution states that the president of the National Assembly would be in charge of the executive branch until elections are held. Guaido reiterated his request to Venezuelan security forces not to shoot at the community who is protesting when they take the streets.